If you want to perfect your warrior 1 or downward dog, now’s the perfect time because September is National Yoga Month? To celebrate, you can win a great yoga essential— an eco-friendly yoga towel from Manduka. Katherine does yoga a lot, and even goes on yoga retreats. I generally hobble into a yoga class after I’ve injured myself in CrossFit. Yoga is great for everyone to help improve balance, coordination and flexibility. It’s also good for your muscles and bones and can help lower blood pressure and alleviate stress. Bottom line: Practicing yoga is good for your health! Manduka makes everything a yogi needs—whether you’re a beginner or advanced in your practice. They sell high quality mats, towels, accessories and even great yoga wear for men and women. The product are made to last and to help maximize your yogi potential. 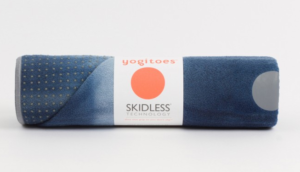 Three lucky AFH winners will win a Yogitoes towel. Yogitoes come in wonderful colors and designs and are an absorbent, non-slip towel featuring skid-less silicon-nub technology and a soft surface. Made from recycled water bottles, the towels are also machine washable. I have seen to many benefits to count! 🙂 I feel so much more balanced and flexible physically and mentally! There’s no one that cannot benifit from yoga! I have liked AFH on Facebook! I liked Manduka on Facebook. I like yoga because I feel good after I have had a chance to stretch and work out the tension. It is relaxing. In yoga, I get to set aside some time to relax and forget about the stresses of the day! Plus it gives me a great stretch and works my core! I love it! I’ve signed up for your newsletter, and like both you and Manduka on Facebook! Thank you! stretch away stress and breathe ! Get your newsletter, liked Manduka on Facebook and love yoga because I can feel the increased blood flow in my body. It makes me feel alive. I liked AFH and Manduka on FB and get your newsletter. I practice yoga morning and evening so I can move more freely with less joint and muscle pain. It helps my wonky knee and stiff hip too. Morning yoga on my back deck is the best! Yoga is a great way for me to relax, deal with daily anxiety, and stayed centered in this busy world. It’s also a great tool that has helped me avoid injury as a runner. Yoga makes me omnipresent in all areas of my life- my thoughts, my breath, my fears, my body. Yoga awakens me and keeps me grounded. Yoga makes me feel whole. Yoga has helped me feel more calm, less anxious. It has also contributed to my running by helping me with balance and with my hips and core. It’s been an amazing journey so far and its only been a few months. I like the variety: Yin, Vinyasa, Hatha, Nidra. It makes me feel so much more relaxed and balanced. I feel much less tense and my muscles feel so much better after stretching. Yoga makes me feel strong – mentally, physically and spiritually. I’ve never felt so accepting of myself until I started regularly practicing yoga! I am new to Yoga but I think it’s benefits are essential for aging healthy and graciously. I subscribe to AFH newsletter. I Like Manduka on Facebook. I liked AFH on Facebook. I like yoga because it helps with strength and helps create a sense of calm. It helps with my anxiety and calms my mind. It also helped with my posture and back pain. It improved my posture and helped me feel healthy physically and mentally. I like yoga because of the way it makes me feel physically! I liked AFH and Manduka on Facebook. Yoga makes me feel healthy and invigorated. It has made me feel relaxed and improved my flexibility.